Nevertheless, he’s content enough with his quiet country life-until a mercurial wastrel named Charles Worthington explodes into it. And Robbie is assigned to play nursemaid to an invalid with an attitude. Over chess matches and conversation, these polar opposites challenge each other to break out of old patterns, until desire burns through the thin veneer of pure friendship. Yet their passion could destroy the family bonds they value so highly. Especially when someone catches wind of their relationship-and threatens blackmail. Bonnie Dee and Summer Devon’s works have become some of my favorite entries when it comes to M/M historical romance. 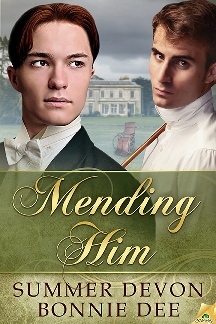 And while The Gentleman and the Rogue is still my most favorite coming from them, this latest “Mending Him” is definitely one that I cherish as well. If I could describe the story, I would use words like “sweet” and “lovely” — because that was what it felt for me. Robbie Grayson was taken by the Chester family after becoming an orphan. However, though related by blood and though he’d been helping his uncle with the business, Robbie always felt that he was never part of the family. Then came Charles Worthington, who arrived at the Chester residence after being injured and broke. Charles — in his rakish way — saw Robbie for more than his worth and Charles challenged Robbie to dream bigger. While Robbie, with his shyness and loyalty to the Chester family, made Charles learn to be less reckless. They were really lovely together — including during their intimate moments. There was one ‘threat’ coming at them, in a form of blackmail about their circumstances. But what I appreciated from this story, every single character, including the blackmailer, actually invoked some sort of sympathy. It wasn’t totally black and white and the blackmail happened out of some sheer desperation. I was also happily surprised with the matron on the family — whom I thought would be, well, the kind of ‘villain’ here because she seemed kind of fickle and selfish — but she ended up showing a sound judgment when it came to Robbie and Charles’s relationship. The story had a good pace — and it was rather light in drama but I totally enjoyed every minute of it. This entry was posted on September 4, 2014 by Ami in Historical, Reviewer: Ami and tagged 4 Stars, bonnie dee, samhain publishing, summer devon.